With its beautiful design, easy-to-use interface, and lightning fast speed, the Yahoo Mail app makes reading, organizing, and sending emails across your inboxes (Gmail, Outlook, AOL and more) easier than ever. 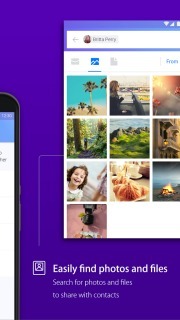 Yahoo Mail offers 1000GB of free cloud storage, so you never have to delete a message again. - SWITCH BETWEEN ACCOUNTS - Add your Gmail, Outlook, or second Yahoo account right in the app. - NEVER LOSE AN EMAIL - Keep all of your emails with 1000GB of free cloud space. - DITCH PASSWORDS - Enable Account Key for secure password-free sign in. - SAY IT WITH A GIF - Can&rsquo;t find the right words? Send an animated GIF. - SEND STATIONERY - Send emails with artist-designed stationery from Paperless Post. - CONNECT GOOGLE DRIVE AND DROPBOX - Easily access and send photos and documents you&rsquo;ve stored in the cloud. - BE IN THE KNOW - Get news from Yahoo and the Yahoo Magazines right in the app. We&rsquo;re committed to creating the best mobile mail experience possible and would love your feedback: https://yahoo.uservoice.com/forums/251116-yahoo-mail. If you want to try out new and experimental features before other Yahoo Mail users, opt in here: https://play.google.com/apps/testing/com.yahoo.mobile.client.android.mail. Your participation and feedback will help us make Yahoo Mail better, faster, and more stable. - Yahoo does not provide a local Swiss email service. divix player v3 by sh..
Yahoo Mail Stay Organized Down..
Yahoo Mail For Android Phones ..